When a person gets injured, stuck, or lost in the Bulgarian mountains, helping them can be very difficult. The often-dangerous terrain can pose numerous challenges for regular first responders. In many cases, mountaineering expertise are required to access the people who need help. This is where the Bulgarian Mountain Rescue Service comes in, providing an effective emergency response service through specialised Red Cross volunteers who know the mountains well. The service was established in Bulgaria in 1933 and moved under the auspices of the Bulgarian Red Cross in 1951. At first, rescue activities were few and far between, as the material capabilities of the mountain rescue service were relatively low. With time, however, it grew and developed. First aid points were set up in the mountains and rescue teams were created to be on call in case of emergencies. 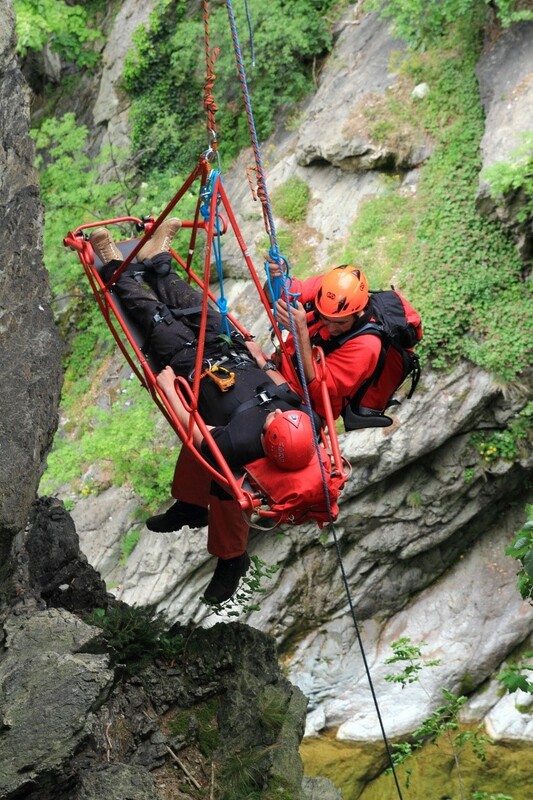 Since the service became a member of the International Mountain Rescue Organisation in 1971, it has been exchanging techniques and tactics with similar actors in other countries in areas like helicopter aid, or the training of rescue dogs. Today, the service involves 32 rescue teams and 650 volunteers who assist lost or injured people in the mountains. 50 paid rescuers work to manage rescue activities, the material equipment, and 24-hour rescue outposts, in which operators listen for distress signals and dispatch help where needed. The mountain rescue service also counts on 58 volunteer physicians, whose role is to provide medical assistance in hard to access locations, or during transportation to the nearest hospital. In order to become mountain rescuers, Bulgarian Red Cross volunteers need to pass a two-year training course to gain enough experience with first aid, mountain rescue techniques, and skiing – as in the winter, the mountains are often covered in snow. Volunteers get to know the topography of the mountains and learn to navigate the areas so they can communicate their whereabouts during emergencies. They are also required to go though various qualification courses to equip them to work in difficult mountain terrain, know how to react in avalanches, and conduct air rescue operations. Prevention and risk reduction are also important aspects of the service’s activities. The Bulgarian Red Cross provides daily updates to national and local media outlets on the weather conditions in the mountains. This information is essential for skiers and tourists who want to explore the terrain safely, without surprises. The official website of the mountain rescue service also shares daily overviews of the avalanche hazards in the four main Bulgarian mountains, along with recommendations on safety measures for hikers. 2018 was a record year for the service, with over 100 rescue operations executed and 2,522 people found in the mountains. According to responders, the most common reason for incidents is an underestimation of the difficult conditions in remote areas, coupled with an overestimation of a hikers’ own capabilities. This is why safety education is a priority for the Bulgarian Red Cross, which has been committed to reaching out to as many people as possible. Its experienced rescuers regularly visit schools and conduct training programmes on safety measures and preparedness.